Have you ever noticed the old brick school on your way to Biggby? Have you ever found yourself by a large stone church after wandering too far right from Goodrich? Or maybe you’re curious about the building that overlooks the Equestrian Center? What did they used to before they were seemingly abandoned? Could they be used again? Albion College is currently in possession of Washington Garner Middle School (the school near Biggby), St. John’s Catholic Church (the large stone church) and Bellemont Manor (the building overlooking the Equestrian Center). So what are the stories of these buildings? What is keeping them from being torn down? Named after a distinguished Albion College professor and Michigan State representative, Washington Gardner School has been a prominent building in the community since its establishment in 1927. This building has functioned as a junior high and high school. When the school was open, children of Albion professors attended and some of the professors themselves had attended there. Because of this significance, Albion College decided to buy the building when it closed so that outside investors would not step in and strip the old school of its resources and potential, leaving a shell of a building. Today, the empty classrooms and gymnasium are used for storing extra desks, chairs and other surplus school supplies. The backyard of the school is currently used as a nursery for the trees and plants you see around campus. With its stable brick structure, the new renovations to the atrium and the intricate wood details throughout the school, it’s easy to imagine the building being used once again. Ideas such as repurposing it for college classrooms, offices or even housing have been mentioned, but until a purpose arises, the college will otherwise just keep preserving it. The community seems to support this. According to Don Masternak, director of facilities, there have been no reports of graffiti or harm to this building in the past few years. Furthermore, the college continues to involve the community by hosting a garage sale of sorts to offset some of the costs and give people the opportunity to buy some great supplies. Another well-built building waiting for purpose is the old St. John’s Catholic Church. Due to a combination of an aging membership, lack of Americans with Disabilities Act accessibility and finally a building of a new St. John’s Catholic School and parish nearby, the parish’s numbers dwindled until it closed and was sold to Albion in 2001. Due to its location on campus and its impressive structure, it is a building full of potential for the college. 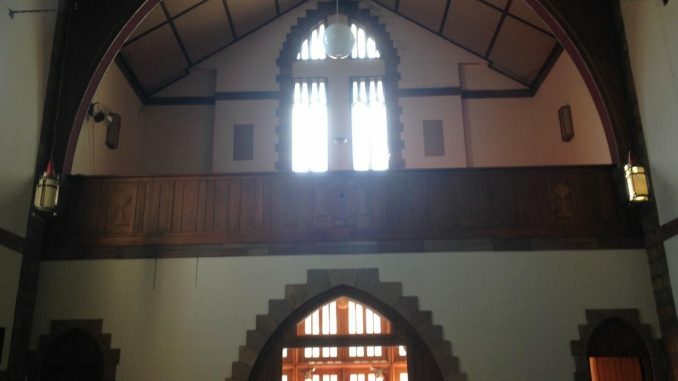 The building has high ceilings, a spacious main floor and a sturdy stone architecture; there is plenty of room to imagine what the building to could be used for. According to Masternak, all options are open, but there will have to be some serious updates in order to get the building up to code. Until then, St. John’s is being used to house theater props and furniture. Bellemont Manor has been a part of Albion College since Union Steel donated it in 1962, but in more recent times has not been used to it highest capacity. In the past, it has been used as a home, a conference center, lodging space, an event venue and a meeting place for the Board of Trustees. Like the other two buildings, Bellemont Manor possesses great value. Today, it is still occasionally used for lodging and meetings. But, with its multiple rooms, beautiful interior decorating and great location and yardage, it would be nice to see it used for larger events more frequently. While these three buildings all possess great potential, the question begs to be asked: is the historical and potential value of these buildings worth the spending of college funds? President Mauri Ditzler said that as of now, the amount of student tuition that is going into the upkeep of these buildings is “modest.” But, if the purpose of these structures increase, so will funds. That’s why the college needs one great idea that the college can really commit to. Ditzler said that in the past architects, faculty and students have all looked into the buildings, but so far no ideas have fit the size or style of the buildings. However, it was stressed that money would not be put into these buildings if there wasn’t any hope. “These buildings are underutilized,” Ditzler said. However, he is optimistic and would love to see more purpose given to the school, church and manor. He said that he wants the buildings to be a bridge between campus and the community. Although students frequently pass these buildings to get coffee or visit downtown, their vacancy can be eerie. If students were to eat, hang out, learn or work in these buildings, they would feel safer transitioning off campus and into town. President Ditzler said that he would be very glad if students were to step up and start a conversation about these buildings.